Plants to 15 dm. Stems sometimes reddish, slender. 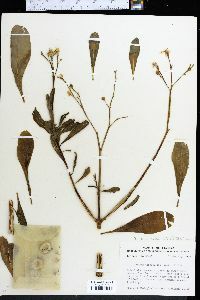 Leaves to 12 cm, reduced abruptly beneath inflorescence; blade elliptic to obovate, base attenuate. Inflorescences paniculate, sometimes nodding. Flowers: sepals deciduous, sometimes reflexed, ovate to suborbiculate, 2.5-4 mm; petals red or pink, sometimes orangish, yellowish, or purplish, ovate to suborbiculate, 3-6 mm; stamens ca. 15-20; stigmas 3, linear; pedicel terete, ± uniformly slender, to 20 mm. Capsules subglobose, sometimes obtusely trigonous, 3-5 mm, exocarp and endocarp usually separating after dehiscence; endocarp valves persistent, remaining connate at apex, attached to receptacle by vascular strands from capsule apex; exocarp dehiscing from apex, valves deciduous ± separately. 2n = 24. Flowering and fruiting Jun-Nov, year-round in s Fla. Moist to dry woodlands and savannas, also desert scrub, grasslands, beaches, on flats, mounds, slopes, ledges, in sand, clay, limestone, sandstone, igneous, often rocky soils and crevices; 0-2200 m; Ariz., Fla., Ga., Ky., La., N.Mex., N.C., S.C., Tex. ; Mexico; West Indies; Central America; South America; introduced in s Africa and s Asia. Talinum paniculatum is generally thought to be native west of the Mississippi River and adventive eastward, where it often is weedy. 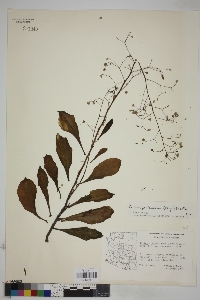 In many herbaria, specimens of T. paniculatum are filed as T. patens. Talinum spathulatum (T. chrysanthum) sometimes is recognized separately, but the few differences are minor and inconsistent, and almost all degrees of intergradation occur over much of the range. PLANT: Herbs to 1 m tall. ROOTS: tuberous. STEMS: erect. LEAVES: short-petiolate; blades elliptic to obovate, basally attenuate, to 12 cm long, reduced upward. INFLORESCENCE: spreading, to 25 cm long. FLOWERS: sepals ovate to suborbiculate, 2.5-4 mm long, sometimes reflexed; petals ovate to suborbiculate, 3-5 mm long, red or pink, sometimes orangish, yellowish, or purplish; stamens ca. 15-20; stigmas 3, linear. CAPSULES subglobose, sometimes obtusely triquetrous, 3-5 mm long. SEEDS: ca. 1 mm long. NOTES: Moist to dry habitats in woodlands and savannas, also desert scrub and grasslands, in rocky soil and crevices, in open and often in shade: Cochise, Greenlee, Pima, Santa Cruz cos.; 750-1600 m (2500-5200 ft); Jul-Oct; NC to FL, w through NM; Chih., Coah., Son., Mex. s to Argentina. REFERENCES: Allison Bair, Marissa Howe, Daniela Roth, Robin Taylor, Tina Ayers, and Robert W. 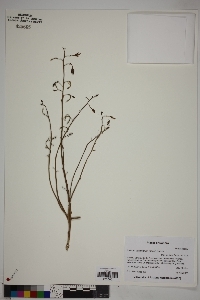 Kiger., 2006, Vascular Plants of Arizona: Portulacaceae. CANOTIA 2(1): 1-22.